When it came to designing the Beni, the Bellerive team worked from the inside out. Why? Because the pot is the foundation of any stove. After all, food is cooked in pots, not stoves. So our goal was to capture as much heat as possible inside the pot to cook the food. To dothis, as we knew from “channel stove” designs, the stove must hug the pot — in other words, the pot must be set inside the stove body in order to recuperate the maximum amount of heat. So it is the pot that dictates the dimensions of its Beni stove. Across most of western Africa, cooks preparing food for large numbers of people favor large spherical cast aluminum pots. These pots come in a variety of sizes and capacities and you find them in hospitals, schools, barracks, prisons, the palm oil industry, breweries, and other businesses that cater to employees or the public. 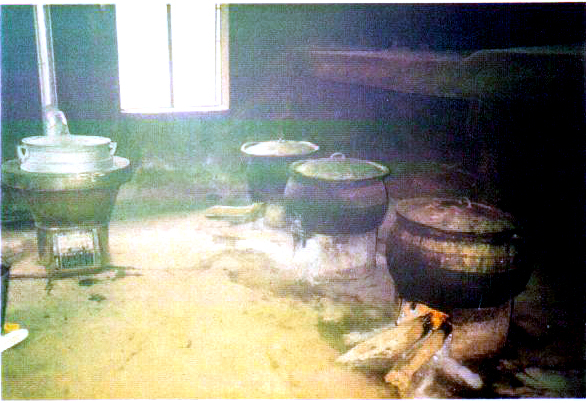 Traditionally, cooks set their pots on three large stones, cinder blocks, or truck wheel rims — some caterers and cooks even wedge pots between two low walls. The point is to raise the pots off the ground in order to build a fire beneath them. This is the co-called three-stone fire. Another popular method is to cut an oil drum and rest the pot on its rim. In northern Nigeria this cut-off drum is called a Murfu. Cooks then cut a large rectangular opening at the base so they can build and feed a fire under the pot. Sometimes, they cut a triangular hole opposite the fuel opening to channel the smoke. 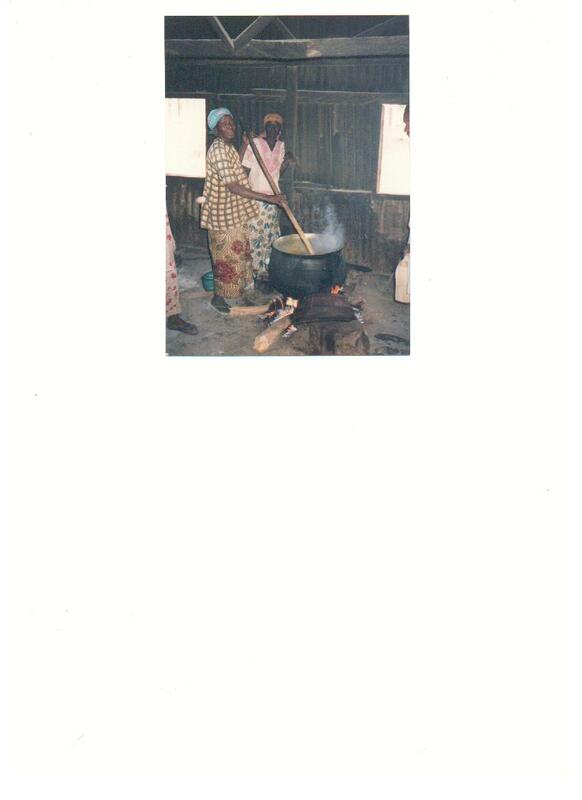 In both the three-stone fire and the oil-drum stove, cooks feed the fire with long pieces of wood. As the fire consumes the end, the cooks push more of the log in. This makes for very hot, smoky and sooty kitchens and wastes extraordinary amounts of wood. In designing the Beni, we took the Murfu as our starting point. We used a cut-off oil drum for the base, then topped it with an inverted cone of sheet metal. In turn, the cone supports a hollow ring connected to a chimney pipe. The benefits of this improved Murfu are immediate. The Beni requires minimal training. It removes smoke from the kitchen, significantly improving working conditions for cooks. And the Beni reduces fuel consumption by a minimum of 50% — given the complexities involved in measuring fuel-efficiency, we are reporting here a very conservative estimate. We tested the PHU (percentage of heat utilized) and obtained a range between 39% and 46%. This contrasts with readings between 14% and 20% for the Murfu. This said, proper management of firewood resources is crucial to an institution’s overall success in lowering fuel consumption. The Bellerive team also worked with institutions to develop efficient approaches to the collecting and preparation of firewood. 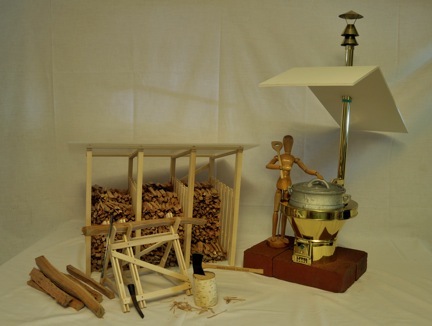 Dry wood has a much higher caloric value and consequently burns more efficiently and cleanly. As a result, the Bellerive team encouraged institutions and individuals to cut, split, and stack their wood for drying. This is included in an energy-conservation series that Bellerive created as a curriculum for upper primary home science classes.